TILE DOCTOR ® Terracotta Tile Restoration. The photographs at the top of this page and to the right of this text were taken from a job we did at a Restaurant. The tiles were ingrainded with black dirt and proved most difficult to clean, normally we only recommend 9 coats of sealer for Terracotta but used 12 coats for this floor due to the high traffic. PLEASE NOTE: It's important to remove any cleaning solution effectively using a wet-dry Vac machine before sealing; any cleaning solution left on the surface may impact the performance of the sealer. Effloresence problems usually occur when salts are in contact with the tile from an outside source. This is most evident in porous tiles where the effloresence can seap through. For example we have come across a number of jobs where the contractor has used a sand and cement mix with terracotta tiles and over a short period of time the salts that are evident in the sand and cement crystalize into the tile and a whiteish bloom develops on the surface of the tile often cracking the sealer. If a cement based adhesive was used from a reputable tile shop this problem would never have occured. A solution of Concentrated Acid mixed 1 to 3 with water will ease the problem temporarily, but you will find in most cases the effloresence will repeat itself until all the salt crystals have evaporated on the surface, and this can take months in some instances. Preston After putting salt granules into the dishwasher one or two granules fell onto the terracotta floor tiles and were unwittingly trodden. We now have two tiles by the dishwasher which are badly stained/bleached and spots along the floor where remnants have been trodden in. Is there a cure?. Tile Doctor The dishwaher stains have probably damaged the sealer, but not the tile as the sealer protects the tile. If you know which sealer has been used, then reaply a coat or two, clean the stain with Pro-Clean Tile And Grout Cleaner available from our website, if your not sure which sealer was used then we have one called Seal and Go, although it might not be compatible and give you a 100% perfect finish it will still look better than stain spots. Chester I have a terracotta tiled kitchen floor - waxed. I recently had a small flood and water got under some of the tiles. the affected tiles are now showing white patches! What can I do? Tile Doctor The white patches are mineral salts (also known as effloresence) they will disapear in time, but you could try a couple of coats of sealer which will get rid of most of it. 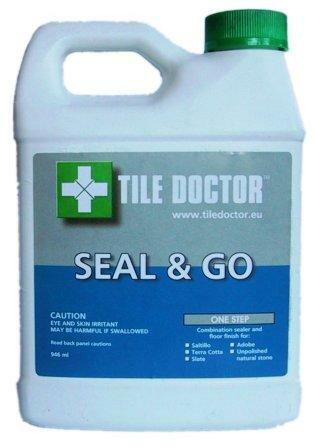 We have a sealer called Seal and Go which is excellent on Terra-cotta. 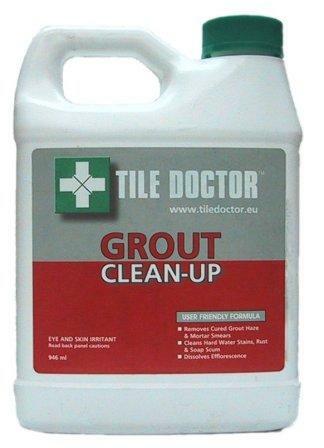 For more Tile Doctor advice see the Ask the Tile Doctor web page.